Positive habits are routines and processes that once implemented help to provide clients with a regular dose of consistency. For clients, this means a higher chance of success, of building a world outside of the sessions that feels comfortable and progressive. For therapists, this means higher rate of success, reduced amounts of emergency sessions and an improved resume for client success. Implementing positive habits and routines can have a profound impact on all aspects of our lives. As a client, just adding a range of positive habits will dramatically improve the feelings in and outside of sessions. But what’s the science behind positive habits, how do they impact our brains and our progression with controlling mental disorders? Not convinced by a positive attitude outside of sessions? Let the science do the talking. Progressive, positive habits have been used for many years as one of the ways to reduce daily stress and anxiety. The act of engaging in positive routines or thinking has been in play and used as a strategy to combat many disorders like depression for many years, and has been recently implemented in many treatments for anxiety to help curb the mental stresses of coping with a mental disorder. Research from the last 20 years has showcased the success of positive rituals into the anxiety that commonly follows us around our daily routine. Barbara Fredrickson, a highly regarded researcher into psychology covered this in her 1998 research into positive thinking and emotions. Fredrickson’s research explored the nature of positive habits by undergoing an experiment with a group of working adults. Split-testing the group, randomly selected, half of those who participated in a meditation practice of “loving-kindness.” This routine overtime produced the daily experience of positive emotions, which in turn fueled the awareness of a broad range of personal resources (mindfulness, purpose, decreased illness symptoms). This successful experiment introduced many other researchers to explore how this would affect the brain and the mindset of those suffering from mental disorders like anxiety and depression. A 2002 study explored the relationship between “gratitude” and our psychology, concluding that the depth that gratitude can bring is “undeniably” significant. The researcher, Shelton (2000) discusses the 4-stage process to acquiring recognition, documenting the steps to cultivating how gratitude can be implemented through self-talk, positive habits and routine as well as a host of other benefits. So how can we cultivate positive habits and thinking? What can we recommend to clients to progress and optimize their skills? There are many different ways you can get started, and it’s as easy as implementing one or two into your routine, then layering even more on as you get comfortable. Explaining to clients about the impact of their vocabulary can be a beneficial exercise. Using negative words have an enormous impact on our actions and emotions. Asking your client to consider the use of their wording, for example; exchanging “I’m bored” with “I need something to do,” can dramatically change your outcome. Starting to can be a useful exercise for them to get started on. Using a simple 5-10 minute session every morning will help your client to adopt positive thinking and a routine to help start their day out strong. The concept of self-care revolves around you. Nurturing yourself is something many misses in their routine due to the stress and speed of the day. Grabbing 30-minutes to run yourself a bath or even taking yourself for a spa treatment can help adopt that self-care aspect that can contribute to avoiding stress and anxiety in your day. Adopting a healthy sleep schedule can be one of the best ways to take care of yourself. A full 8 hours of sleep can change the positivity and proactiveness of your brain by refueling it after a long hard day, recommending to your clients a long healthy night’s sleep can be one of the best routines to start. Not many people smile in their day today. On the bus, on the train, or even at home with family, smiling can be infectious. Recommend to your clients to try smiling ten times in their day, in situations they don’t need to; they’ll begin to feel the benefits of this when others react in a positive way back. Avoiding fast food can be a healthy attitude to adopt. Heavy foods like cheeseburgers can make you feel groggy and tired. Adding a range of foods to your diet, freshly cooked meats, and vegetables can help to keep your client feeling positive and higher in energy. A simple vision board can be an excellent piece of craft to build. Looking at this morning and evening can bring back positive memories, and refuel you for the next day or the day ahead with goals and targets that you’d like to aim for. It’s not difficult for your client to start and a perfect and easy way to implement a happy and healthy practice. Adding a 10-minute gratitude session to the end of your day can pay dividends to your attitude towards life. A gratitude journal can provide clients with a way to reflect and provide themselves with feedback that they’ll need to move forward. A healthy habit used by many of the most successful individuals around the world. All of these habits are soaked in positivity and will help you make the active approach towards conquering your mental health issues. Helping your clients to implement these healthy habits can be one of the best ways to improve the results for your client, but also to help them achieve their goals more sustainably. Using these active and healthy habits as homework for your clients can be a great way to get started with positive habits and routines. Using a digital tool like Therachat, that allows you to send these habits and reminders to clients can help them practice these skills in between sessions, help track their efforts and communicate the results back to you. Knowing whether your client is finding these helpful can help you prepare for the next session better. You can also print these out & give to your clients. Let us know in the comments whether you’ve been able to implement any positive habits for clients in the past and present; any recommendations will be warmly received. 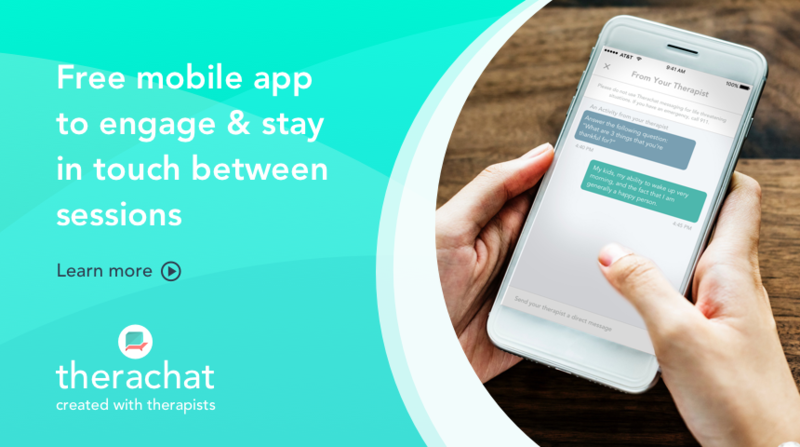 Therachat empowers you to engage your therapy clients in between sessions without taking up all your time or violating boundaries.